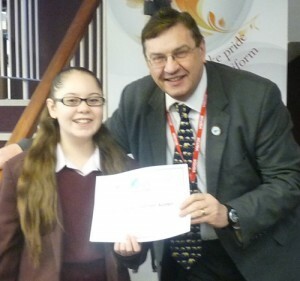 Congratulations to the 2015 Schools Memory Champion Lia Yolanda Freeman Austen from Invicta Grammar School in Maidstone in Kent seen her being presented with her certificate by WMSC General Secretary Chris Day. A big thank you to Carrie and Kirsty and the team of Learning Performance for organising and staging the competition. The Schools Memory Championships was created in UK 2008 to help pupils discover the mind sport of memory and to develop their mental skills to help with their studies. Since it was founded in 1991, The World Memory Championships has created a ‘gold standard’ for memory based on ten different memory disciplines. A simplified version of these was created for schools memory competitions, backed up with a training programme to help teachers to train memory techniques. This is achieved through an initial training session for a group of up to 30 students and staff introducing them to the three memory sport disciplines, and a range of mnemonic techniques. The training is supported by a comprehensive teachers manual and student workbooks. Competitions are currently staged in school premises, or a convenient local venue. The competitions last approximately half a day. Each school may receive a slightly different set of questions papers to avoid unethical behaviour. At the end of the competition period each student will receive a ranking. The top performing students in each school are invited to a Regional and/or the National Final where the Champion is decided. The three memory disciplines are chosen to closely correspond to those in the World Memory Championships whilst being easily transferable to school subjects. Schools may, if they wish, include a further two disciplines of their choice. For example, the first South African Schools Championships final in 2012 included 15 minutes random cards memorisation and in the first UK Schools competitions binary numbers were added. However, only the three core disciplines are used to determine Schools rankings. The achievements of individual competitors, as well as participating schools, will be recognised alongside the existing Memory World Rankings in a new Schools League on the World Memory Sports Council’s websites. With the growing popularity of memory clubs in schools in other parts of the world, there are plans for an international memory ranking table for competitors under eighteen in the near future. Contact Us for more information on Schools Memory Competitions.